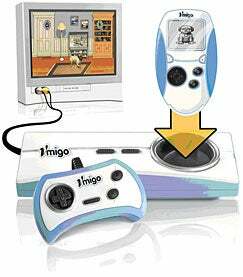 In the relentless quest for the shitless dog, here's a new one, the vMigo, a plug-and-play TV-connected console that includes a carry-around Tamagotchi-like handheld pod with a 16-bit screen and a pedometer inside. If you want your pet to stay happy, you'll have to take it out for a walk, and that pedometer keeps you honest, measuring exactly how far you've gone. Bring that pod home and plug it into the console, and then you'll see a Sims-like virtual world on your TV that looks a whole lot like the Catz and Dogz software games from a few years back. That's where you can make a fool out of your pet by buying clothes for it, getting it groomed and playing little games with it. Set to ship for the holidays, it will be $49.99, with additional pets for $29.99. Cute, but this is only halfway there. Bring on the realistic robot dogs!